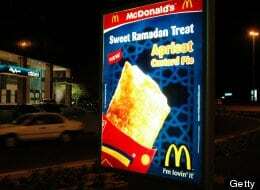 A McDonalds ad during Ramadan in Dubai. Growing up in a mostly Christian neighborhood in southern Virginia in the 1970s and 1980s, Raana Smith remembers feeling “lacking” around the holidays. While friends frolicked at Easter Egg hunts and got giddy over the presents under their Christmas trees each December, her Muslim family’s traditions didn’t translate well into toys or games that other kids could understand. Now 39 and the mother of a three-year-old, Smith is trying to help fill what she sees as a commercial hole for Muslim families raising kids in the United States. Ahead of Tuesday’s first day of Ramadan, the Islamic month when Muslims fast from sunrise to sunset, her Islamic gifts and stationery business, Silver Envelope, has prepared hundreds of Ramadan wares for shipping. They range from an $8.50 Ramadan cookie decorating package to a $15 “Rockets ‘n’ Robots” Ramadan countdown kit (the concept is similar to that of an Advent Calendar) and, for the ambitious, a $69.95 “moon-sighting party” bundle (the holiday period begins and ends with the viewing of the new moon). As the Muslim community expands — Pew researchers have projected America’s 2.6 million Muslim population will nearly double over the next two decades — and more native-born Muslims make up America’s Muslims, a growing number of Islam-related businesses are launching around the nation. While Muslim-owned retailers and services such as Halal butcher shops and Islamic Sunday schools have existed for decades, these new companies cater to a different market. They sell everything from clothing, music and makeup to toys, frozen dinners and cookbooks. Ramadan, the most important month on the Islamic calendar that ends with one of Islam’s biggest holidays, Eid al-Fitr, is the prime time for the Muslim commercial market in the U.S. and even more so abroad. “Up until recently, so much of the focus among American Muslims has been on the religious aspect or the political sphere. But not much has been done in business,” says Sabiha Ansari, event director for the American Muslim Consumer Conference, which held its fourth annual gathering in Newark, N.J. in November with about 400 Muslim business owners in attendance. “We’re trying to promote Muslim entrepreneurs, businesses and general market companies that are making products for, or trying to appeal to, American Muslims,” says Ansari, whose organization cites the U.S. Muslim market as measuring at over $100 billion. The number includes housing, cars, food and services, among other areas. Ansari’s group doesn’t focus exclusively on Ramadan or holiday-related businesses, but growth during Ramadan has nonetheless fueled talk of the fasting period becoming too commercialized, particularly outside the U.S. In majority-Muslim countries such as Egypt and the United Arab Emirates, Ramadan is the biggest sales season of the year, with hotel, restaurant and clothing businesses making some of their biggest profits. An estimate from the Pan Arab Research Center in Dubai three years ago put Egyptian advertising spending during Ramadan at $142 million (62 percent higher than other times of the year). The high numbers are expected to continue despite the nation’s recent regime changes. “As a community, we need something we can relate to, something that speaks to us,” says Maffei, who has been touring to promote her book, “Summer Ramadan Cooking,” and frequently attends Muslim consumer events and conferences.